One of the main purposes of Salem is to add georeferencing tools to xarray ‘s data structures. These tools can be accessed via a special .salem attribute, available for both xarray.DataArray and xarray.Dataset objects after a simple import salem in your code. 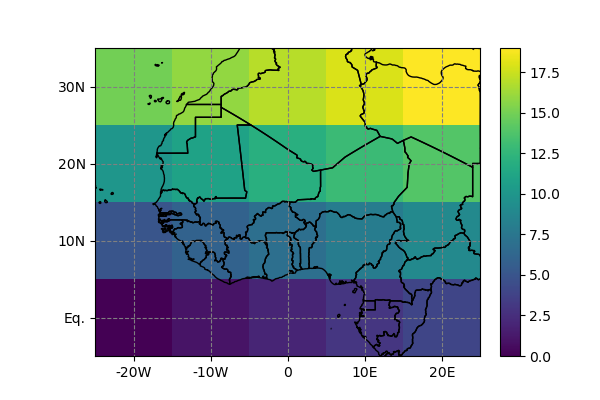 While the above should work with a majority of climate datasets (such as atmospheric reanalyses or GCM output), certain NetCDF files will have a more exotic map projection requiring a dedicated parsing. There are conventions to formalise these things in the NetCDF data model, but Salem doesn’t understand them yet (my impression is that they aren’t widely used anyways). The logic for deciding upon the projection of a Dataset or DataArray is located in grid_from_dataset(). If the automated parsing doesn’t work, the salem accessor won’t work either. In that case, you’ll have to provide your own Custom projection to the data. The accessor’s methods are available trough the .salem attribute. The accessor’s map transformation machinery is handled by the Grid class internally. See Map transformations for more information.